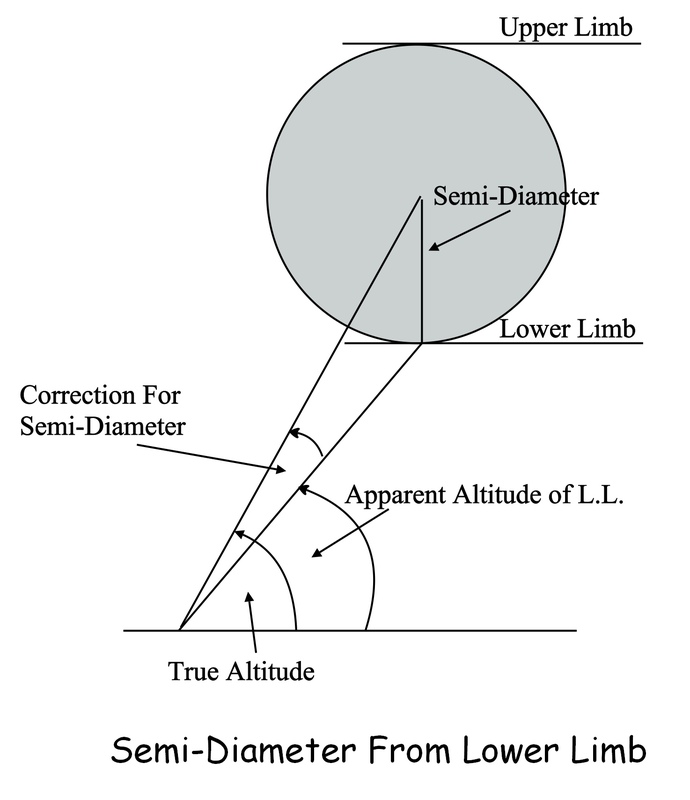 An adjustment for semi-diameter is one of the corrections that may have to be made to the sextant altitude in order to calculate the True Altitude. Corrections For The Moon’s Semi-Diameter. The point on the Moon’s circumference nearest to the horizon is called the lower limb and the point furthest from the horizon is called the upper limb. When the Moon is not full, sometimes only the upper limb will be visible and sometimes only the lower limb. 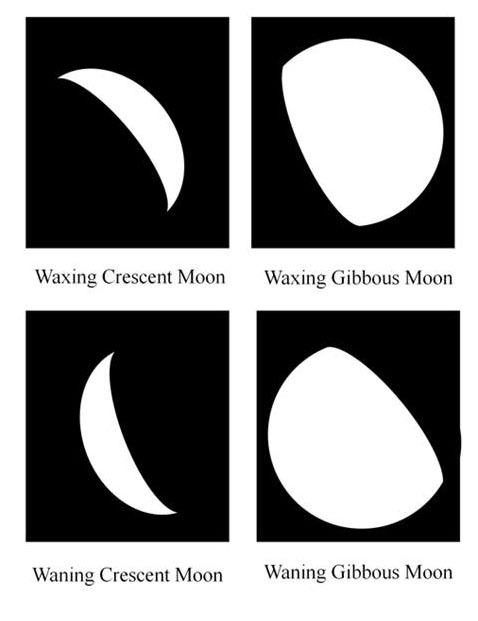 From the diagram below it can be seen that sometimes, depending on the phase of the Moon, either the upper or the lower limb cannot be seen. It should be noted that whether the Moon’s upper or lower limb is visible is dependent not only on its phase but also on the relative altitudes of the Sun and the Moon. For example, if one morning, a crescent or gibbous moon is visible in the eastern sky and the Sun is at a higher altitude, only the upper limb will be visible but if, in the evening of the same day, the Moon is visible in the western sky and the Sun has set below the western horizon, only the lower limb will be visible. In navigational practice, the altitude that we measure is that of the lower limb; however, when the lower limb cannot be seen, we have no choice other than to measure the altitude of the upper limb. Regardless of which limb we use, what we really need is the altitude of the Moon’s centre so we must either add or subtract the value of its semi-diameter. The following diagram shows why the semi-diameter must be added when the altitude when the lower limb is measured. The semi-diameter of the Sun is also given in the daily pages of the Nautical Almanac. However, the correction for the Sun’s semi-diameter is included in the Altitude Correction Tables and so need not be separately considered. Semi-Diameter of Stars and Planets. To the naked eye and even through a sextant telescope, the stars and planets appear as points of light and so there is obviously no need to apply semi-diameter corrections in their cases. This entry was posted in astro navigation, Astro Navigation Topics, astronomy, celestial navigation and tagged astro navigation, astronomy, celestial navigation. Bookmark the permalink.